1944. Betty Kelly (Martha And The Vandellas) born in Detroit, Michigan. 1979. Passing through London’s Heathrow Airport enroute for the United States, Elton John reveals what he’s been keeping under his hat until now – a new head of hair! Speaking of the hair transplant, Elton said, “I had the operation done in Paris and I have another two operations to go before it’s completely finished”. He refused to reveal how much the treatment cost but did say, “Looking at it now, I think it was absolutely worthwhile”. 1970. Robbie Krieger and John Densmore are called to give evidence at Jim Morrison‘s obscenity trial in The Circuit Court for Dade County, Miami, Florida. Judge Murray Goodman, presiding. 1970. Sandie Shaw announces that she’s preganant. The news came after the singer had collapsed in her car on the way to Heathrow Airport where she was due to leave for the Venice Festival. Doctors today revealed the reason for her exhaustion. Sandie’s been married to the fashion designer Jeff Banks for the last two years. The baby, which is due early next year, will be the couple’s first. Sandie’s performance in Venice has been cancelled and she’ll be resting for the next few days. 1965. Shindig! (ABC, U.S.A.) Opening medley (song excerpts): The McCoys, The Byrds, Jerry Naylor, The Everly Brothers and Chad & Jill; The Everly Brothers; The Byrds; Billy Preston; Jerry Naylor; Ketty Lester; The Byrds; The McCoys; Chad and Jill (Chad Stuart of Chad and Jeremy, and his wife Jill); Chad Stuart; The Rolling Stones; Finale: Everly Brothers. Here’s the first segment of the show which will link to the other two parts to give you the complete programme. 8m 57s. 1977. Marc Bolan dies when the Mini in which he is travelling skids and hits a tree on Barnes Common in London. The car is being driven by Marc’s girlfriend, Gloria Jones, who survives. And on this day in 1997, the Performing Rights Society erects a marker at the site of Marc’s fatal crash. On hand to assist in the proceedings is his son, Rolan. 1959. Pete Burns (Dead Or Alive) born Pete Jozeppi in Port Sunlight, Merseyside. 1980. David Bowie starts a three week run as “The Elephant Man” at Chicago’s Blackstone Theater. 1973. The Rolling Stones‘ producer, Jimmy Miller suffers the loss of at least £ 75,000 of studio gear when the Mercer Arts Center in New York (which houses Jimmy Miller Productions) collapses into a pile of rubble. The hotel next door collapses at the same time and although two people are killed, recent Rolling Stones Records signing, Kracker, who are staying there, escape unhurt. 1983. David Crosby is sentenced to five years in jail by Judge Pat McDowell in Dallas, Texas after being found guilty of possessing cocaine and carrying a gun into a bar. His lawyers lodge an instant appeal and he is released on bail. 1965. Where The Action Is (U.S.A.) The Byrds; Jewel Akens; Linda Scott; Steve Alaimo. Here are The Byrds with “All I Really Want To Do”. 2m 02s. The quality of this clip is probably the poorest I’ve ever included but its a real rarity. 1978. Pete Meadon, The Who‘s first manager and writer of “Zoot Suit” dies of barbiturate poisoning at his parents’ home in London. Regular readers will know I’ve been struggling since April to stage a rock and pop memorabilia exhibition at the Red Shoes Theatre in Elgin. In the 1960s it was one of Scotland’s busiest and best known venues for the hundreds of bands who constantly toured the U.K. The Beatles, The Who and Pink Floyd were among the star names that played there. I was in Elgin yesterday, fully intending to have one last go at rescuing the exhibition but ended up driving another half hour west to Nairn. Nairn was home to another venue run by Albert Bonici, the Elgin promoter who’d put The Fabs and all the others on. The Ballerina Ballroom (as it was then called), which played host to The Who, Cream, Pink Floyd et al., has lain empty for years until recently when Nairn based Hollywood actress, Tilda Swinton decided to re-open the venue and stage a film festival there. 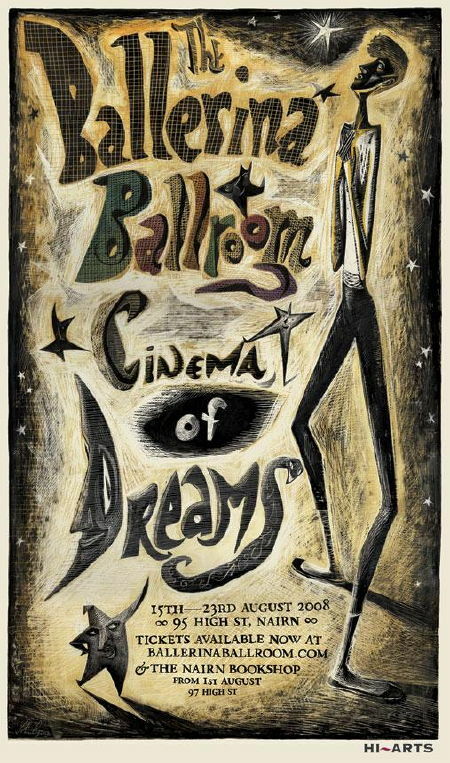 The Ballerina Ballroom Cinema Of Dreams festival lasts 8 1/2 days, starting August 15th. It was easy to find, driving off the main road to Edinburgh, turning left for the town centre and straight into the High Street. A few hundred yards later, I passed it. I found a parking space and walked back. The doors weren’t locked, so I just walked in. There I found Tilda’s husband, the artist and playwright, John Byrne. I explained my troubles with the Ballerina’s sister venue and he instantly showed me a huge ante-room off the main ballroom with large unobstructed walls and agreed it was a great idea and a perfect adjunct to the film festival. So, now I’ve got 10 days to promote and create the exhibition. I’m heading back to the ballroom this morning with some of the pieces I’m planning to hang and get some images for tomorrow’s blog. My plan is to replicate the real exhibition with a virtual version online. Sadly, I’d spent a lot of time researching the bands who played the Two Red Shoes and now I’m going to have to redo that for the Ballerina. I loved the idea of boards with gig adverts, reviews and listings to spark the memories of those who’d attended them. Anyway, enough of what’s to be done. I love ferreting through old newspapers, so I can’t complain. Click on the film festival link above for full details. For some background to the festival, there’s a really great article from The Independent dated July 23rd here.